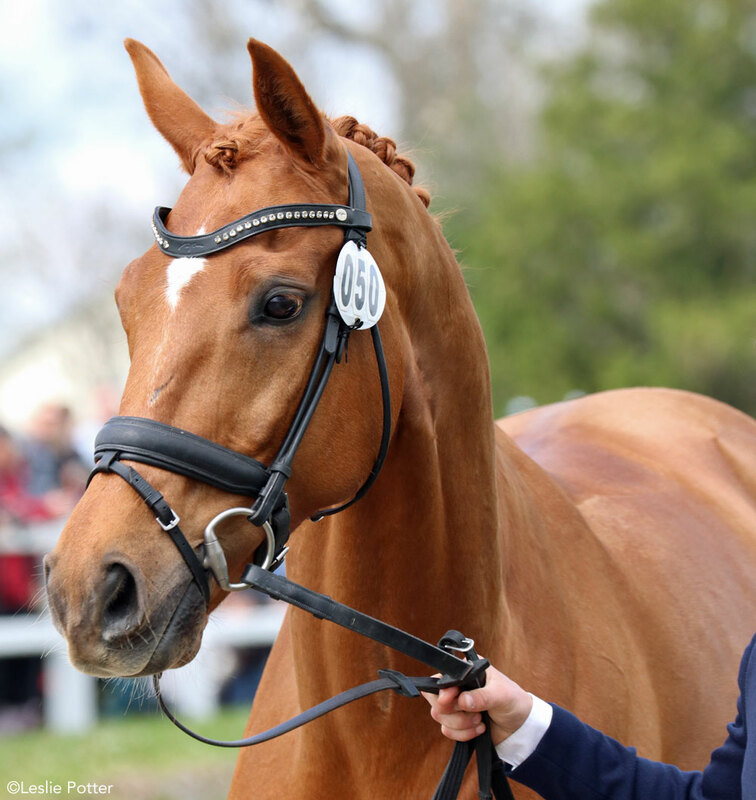 How to prepare your horse to show in dressage, eventing, or hunter/jumper competition. Whether you ride dressage, hunter/jumper or eventing, there is a certain level of show-ring presentation that is expected. It varies slightly from one discipline to another, but these tips will help you get your horse looking his best for any sport horse competition. The first step to great grooming is a shiny coat. You can’t short-change this step; long sessions with the curry comb are necessary to bring out the oils in the coat and get a healthy glow. When you put in the curry time, your horse will carry a nice shine all the time and simply need a few whisks of the brush to look his show-ring best. Once he is groomed to perfection, you may want to keep a sheet and possibly a slinky hood on him in the stall the night before your class. Use coat polish spray (except on the saddle area) for the final finishing touch and to help repel dust. For horses with white stockings, blazes or spots, some extra bathing time is usually required. There are many whitening shampoos on the market designed for horses, so lather up and let the bubbles sink in for a few minutes before rinsing; repeat if necessary. This usually takes care of even the grungiest stains. White tails can be a little more stubborn. Diluted bleach or laundry detergent works well, or you can add a dab of blue antiseptic to a large bucket of water and soak the tail for a few seconds. The bluish-purple color will cover over the yellowed areas, making them appear steel gray or silvery. If you soak too long and get a purple tail, you can just shampoo the excess color out. 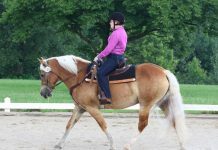 Most of the sport horse disciplines require a braided mane. The secret to good braids is to pull (thin) the mane hair first. If your horse objects to having this done, do just a little bit every day after he is ridden when he’s nice and warm and his pores are open. Grab a few long hairs and back-comb with your other hand, then quickly yank out a few hairs at a time. Once the mane is approximately 4 inches long, it will be much easier to braid. While dressage riders are partial to a few very large braids, hunters make dozens of tiny braids. Eventers are usually somewhere in between. For detailed braiding instructions, view this video. Some of the English disciplines prefer a tail to be “banged” (cut straight) at the bottom, while others prefer a natural look. To bang a tail, have a helper put her arm under the tailbone to simulate its carriage while moving. Make sure the tail is tangle-free (either hand-pick or comb out with detangling spray), and carefully cut the bottom straight across at its thickest point, usually somewhere between the bottom of the hocks and top of the fetlocks. To tidy up the top of the tail and accentuate the hindquarter muscles, you can either pull (like the mane) or carefully clip the top 2 inches or so on either side of the dock. Riders competing in hunter classes do not pull or clip the dock, but may braid the tail at shows where braiding is permitted. To highlight the face, you may want to clip away excess hair along the jawline and on the muzzle. 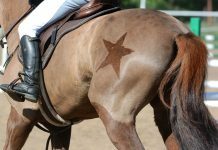 For a final show-ring glow, dab some baby oil onto a rag or your hands and rub around your horse’s eyes and muzzle to darken the skin. The very last step after warming up but before stepping into the show-ring is hoof oil. A quick brush of hoof oil or conditioner will darken and shine the hooves for a completely finished competition look.